Our daughters are six years apart and it’s rare to find play activities they both enjoy equally. When Play Visions offered to send me their Play Dirt, I couldn’t wait for the package to arrive on our doorstep. 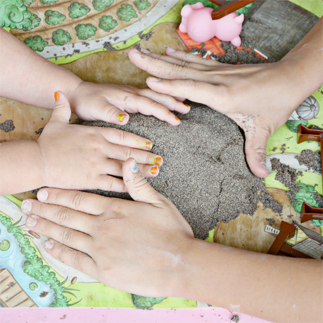 The Play Dirt has the texture of real dirt but doesn’t leave behind the same mess. Little sister loves playing in dirt and her big sister enjoys hands on messy activities so it was the perfect activity for them both. It’s Summer and the sun’s heat is melting the very plastic that is the blinds meant to shield us from the sun’s rays blindingly streaming through our windows. Every where you look, the evidence of the summer heat is apparent. It’s just plain out hot. 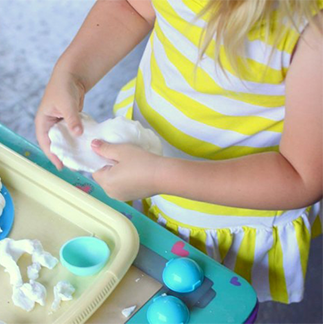 Inside we spend our day hoping to evade the sweltering weather but that doesn’t mean we can have fun and dream of a time when the ground was covered in white instead of crispy brown with Floof Snowball Maker sensory play.